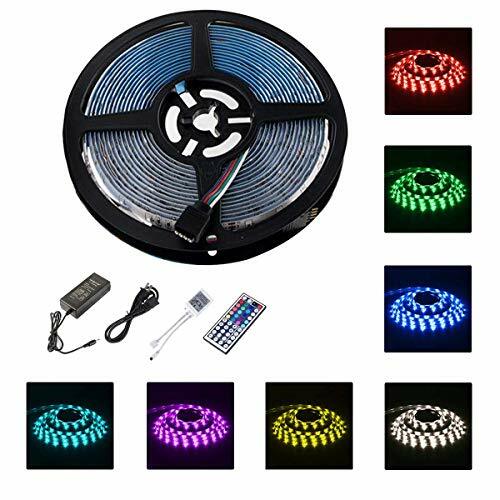 Super Brightness LED Strips: 5050 RGB LED strip light has 150leds with 16.4ft 150leds, and with 44 key IR remote controller and DC 3A 12V The led strip lights is Waterproof -IP65, can be used indoor decoration. Colorful & DIY: LED tape strips lights set will change colors and speed automatically and periodically. It has not only RGB 16 multicolored options, but also has DIY selection to create your great led mood lighting. Best Material: Using double layer copper on PCB board to keep the mixed colors more even. LED IR remote controller has over charging, short circuit protection and memory function. Power supply makes sure the longer working life for the led strip lights and the safety for both adults and kids. Package Content: 1 x 5M/16.4ft DeLi LED Strips; 1 x 44 key remote controller; 1 x IR control box; 1 x power supply; 1 x user manual;guarantee for 90 days for return or replacement and our friendly service - 7x 24 hours customer service response. I love these LED lights! !